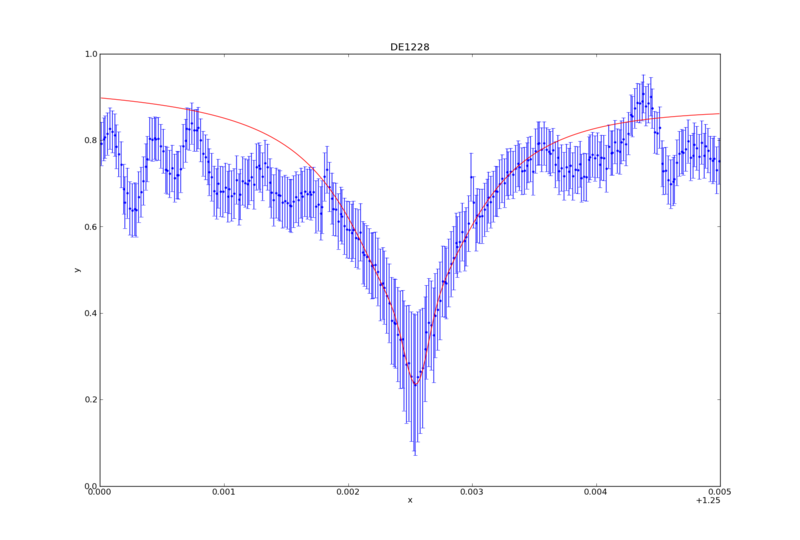 I have spent the last month or so immersing myself in Sherpa, the Python-built program I am using to make the measurements of the Potassium absorption line at 1.2525 microns. While finally coming up for air, I am going to share how I've used Sherpa in order to fit a model (or rather, 3 combined models) to the spectral feature so I can make the desired measurements. I will walk you through an example, the plotting and fitting of target "DE1228". >>> from sherpa.astro.ui import * # This is necessary if you are using Sherpa in a non-standalone version. >>> data = unpack_arrays(w,f) # Loads the wavelength and flux arrays into the data structure, which I've originally named "data". >>> data.name = 'DE1228' # Give Sherpa the name of the target -- this is not necessary, but it will automatically title any plots from now on. >>> set_data(1, data) # I am using the id number "1", which is the default id number, but I will explicitly state it so you can see how to state it. >>> plot_data(1) # This plots the data. 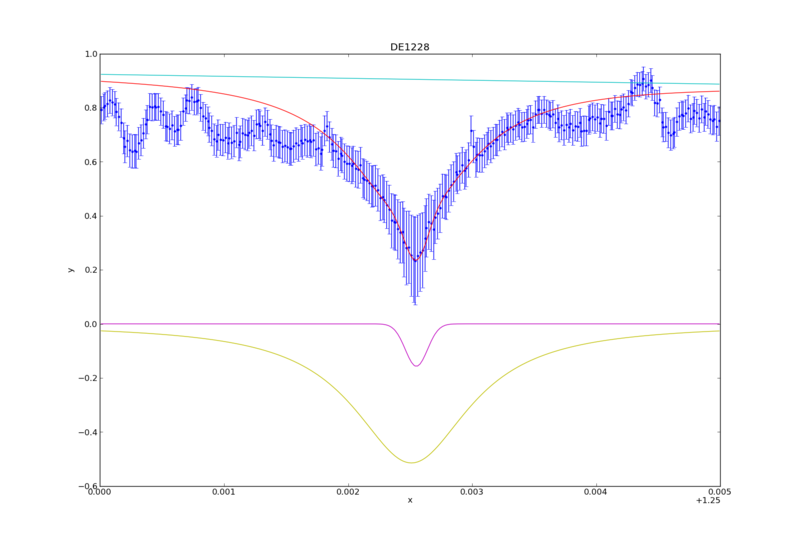 Error is automatically plotted as well. This is not a necessary step for fitting, but it's so you can see what you're dealing with. >>> set_source(1, powlaw1d.pl+gauss1d.g1+lorentz1d.l1) # I used a model containing a power law, gaussian profile, and lorentzian profile to fit the data and absorption line. And that's how I fit the models to the potassium absorption line. I've consolidated a lot of these numbers and commands into a table and python module (sherpa_tools.py). While specific, parts of the module can be applied to other people using Sherpa, so I can share the code if needed. In my next blog post, I'll describe how to utilize the model to make the spectral line measurements (i.e. equivalent width, line-to-continuum flux ratio, full width half maximum).